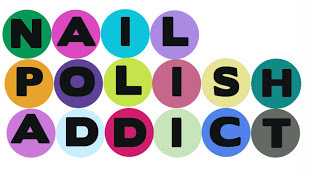 fingers polish mania: It's a Massive Blog Sale! It's that time again people! 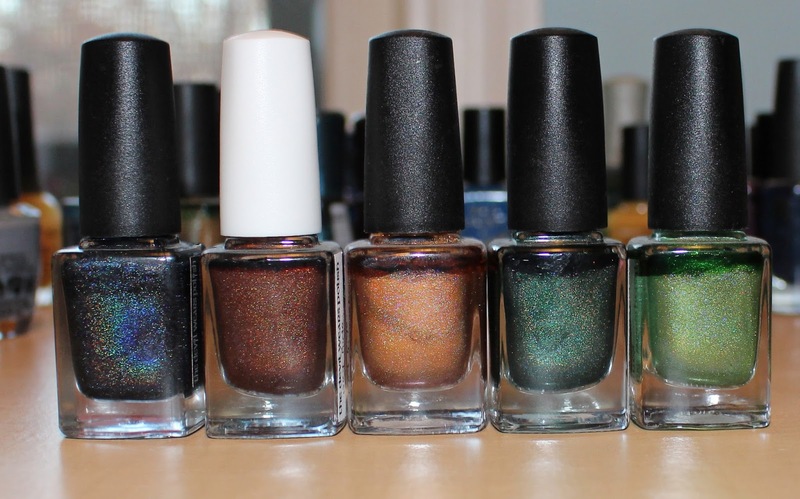 I weeded out a massive haul from my polish collection. Once I see how this goes, I may add more. The problem is, I had too much left over that no one wanted. I may have to just throw the left overs out this time. Another issue is, I don't have a printer nor a scale to determine shipping prices. I know the rates have gone up. 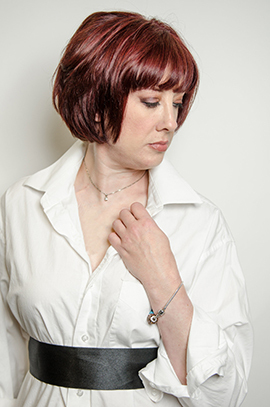 What I do know is that I will try to use this link-so you can check the rates like I do. Now of course, this is for USA people. I normally can get up to 6 polish in a small flat rate priority box. International, honestly I will need to package your polish up and take it to the post office get a price then have you pay me before I ship. Here is a link I will try to use for International. Unless you have another link. I use PAYPAL only. If you want an invoice, you pay all fees. Once it has left my hands, I am not responsible for damages. What I will say is I have successfully shipped to over 25 countries, even Italy and not once had something break or get lost. I will also haggle. Use my MESSAGE ME tab under my profile picture. Oh and first come first served. I won't hold something if someone else wants it as well. If the name has a line through it, it's gone. Some of these will ONLY be sold as a set. I will keep them before breaking up the set. This is The Devil Wears Polish Inky, Hayride, Pumpkin Carving, Equinox and a group custom "No Freebies for A**holes" $8 each. Swatched only. 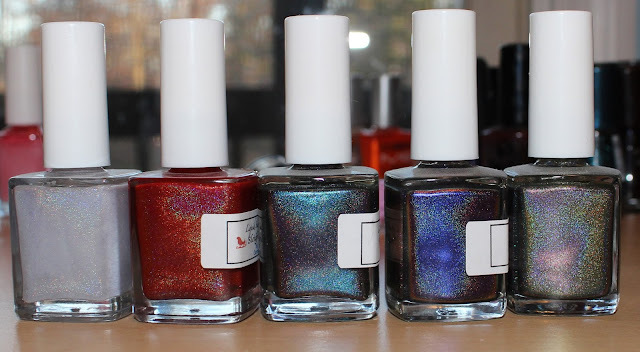 Sinful Polish Star Blast Off, Out of This World, Ruby Ruby, Snow Me White, Color Tag swatched. $1 each. Last one is a brand new Sinful Prosecco $5. This is ONLY as a set. Six NCLA Nudes I-VI. Retail $75, swatched 2&3 only rest new. $60. 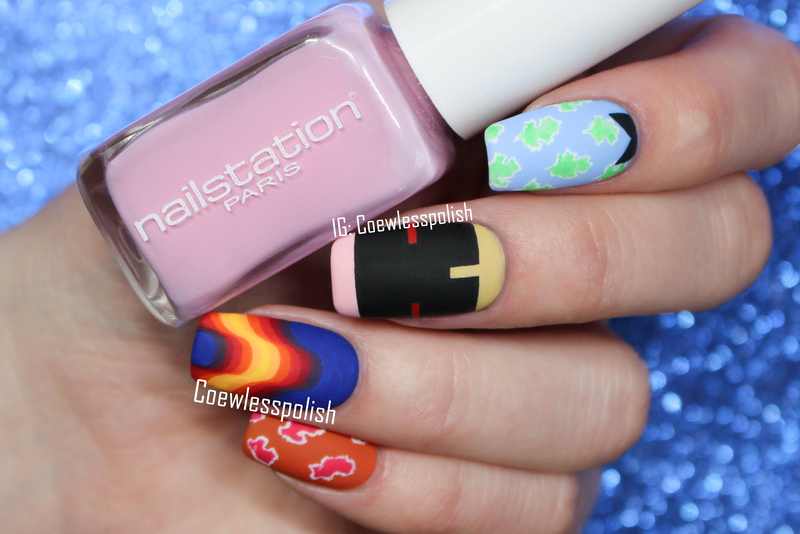 OPI Funny Bunny, Cement the Deal, Dark Side of the Mood, Embrace the Grey and Kyoto Pearl. The greys are new, the outside two swatched. $4 each. This is as a set ONLY. VERY RARE HTF set from 2011. Almost brand new. These are the complete set of ORIGINAL Finger Paints Special Effects Flakies. Motley, Flecked, Flashy, Twisted, Asylum. I even bought sets and shipped them overseas when these came out to Jeannie at Swatchaholic! $75. 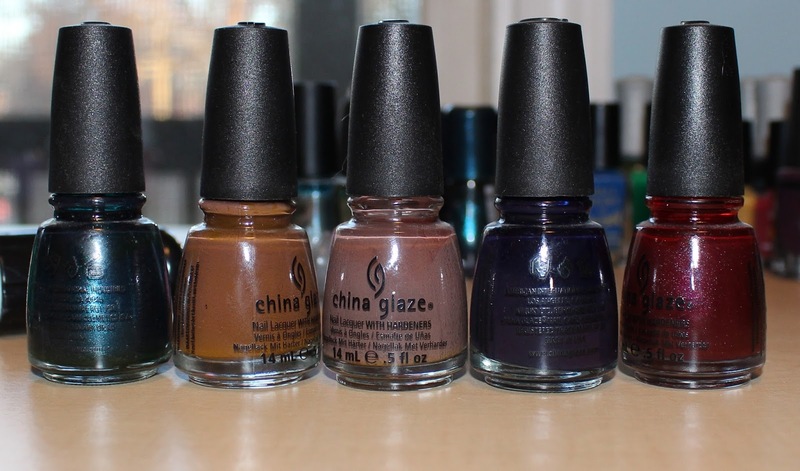 This is China Glaze Emerald Fitzgerald, Mahogany Magic, Street Chic, VII and Loft-y Ambitions. $2 each. These are rare BLACK LABEL OPI. Not sure there is an interest. Don't Whine Yukon Do It, Romeo and Joliet, I'm Not Really A Waitress and Lincoln Park After Dark. $2 each. These are green label OPI. Danke Shiny Red, A Taupe the Space Needle, Swimsuit Nailed It, Espresso Your Style, APiers to be Tan, Die Another Day and Suzi Loves Cowboys. $2 each. This is Color Club Lumin Ice-cent, Perfect Molten, Smitten Blue Footed Booby Dance (new), Pretty & Polished Black Swan, Pure Ice Heartbreaker, Girly Bits Emerald City Lights $3 each. 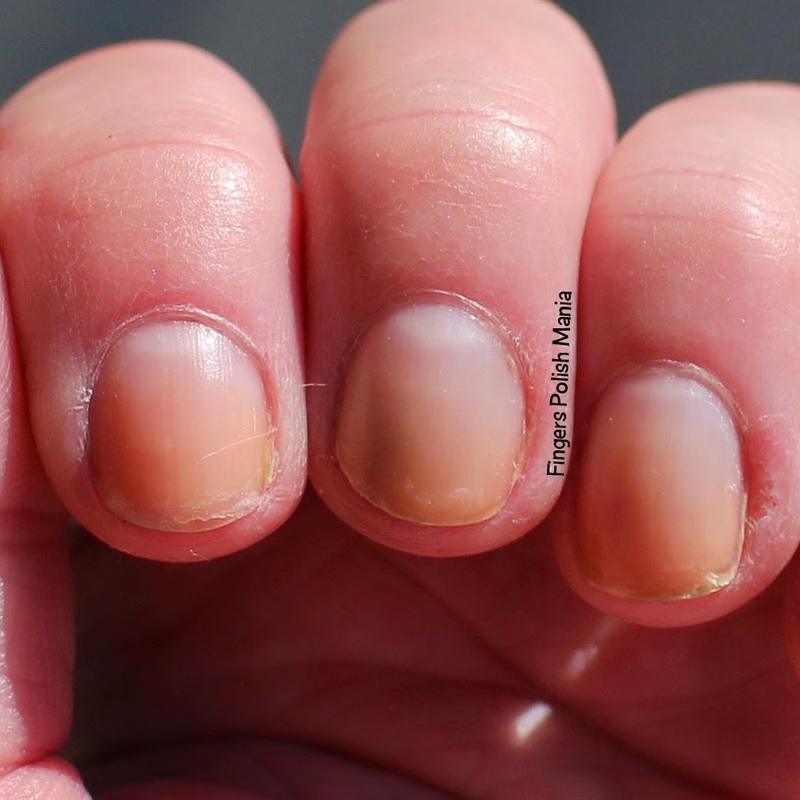 The entire Zoya Naked Manicure set. Set ONLY. Retails $96 here $75. Barielle Boho Chic, Moda Bleu, Soho at Night, Berry Posh, Putt E On Me, Make it a Latte, Vintage Gown, Taupe Notch, Out Grey-geous. $1 each. Inglot Brown, CND Amethyst, Midnight Sapphire, LCN set of four minis. Rita, Marilyn, Audrey, Liz $2 each. Liquid Sky Lacquer Thinking of You, Sleigh Me, Twilight Peacock, Twilight Plumage, Twilight Hummingbird NEW. $7 each. 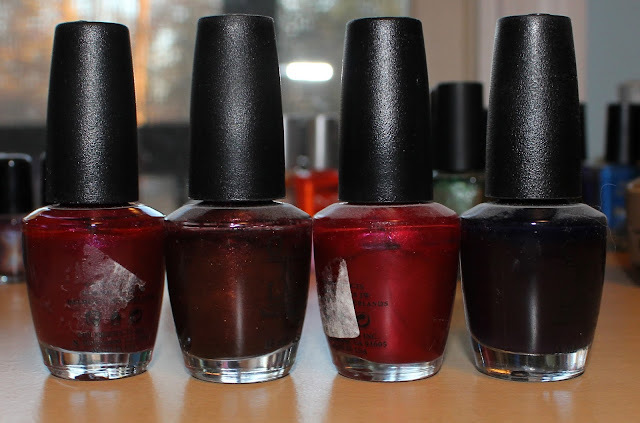 Orly Enchanted Forest, Wandering Vine, Naughty, Le Chateau. $2 each. 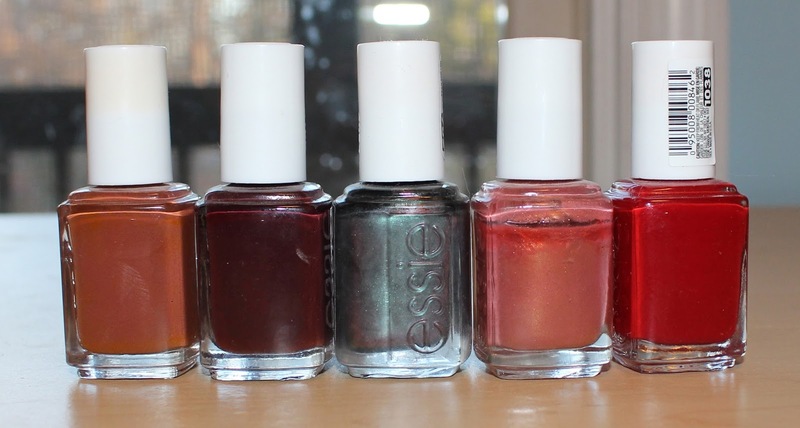 Essence Prom Berry, Miss Universe, Red Ahead, Barry M Indigo, Cobalt Blue, Spring Green $2 each. Dermelect Moon Kissed, Head Turner, Nails Inc Serpentine Rd, Kensington, Kabaret, Lush Lacquer Salt N Peppa, Beyond the Nail Salt and Pepper $2 each. 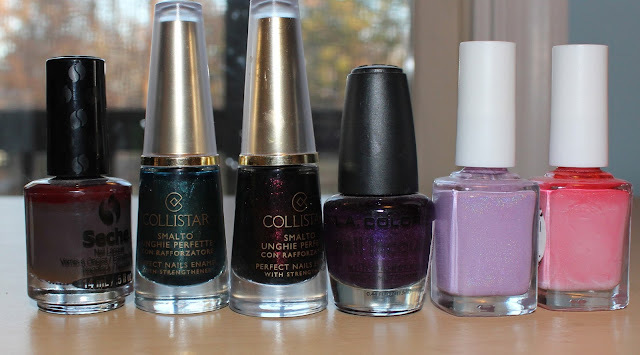 Seche Warmand Cozy, Collistar (FROM ITALY!!!) Petrolio Perla, Melanzana Glitter, LA Colors Amethyst, Painted Polish Sea Lavender, Honeysuckle. $2 each. 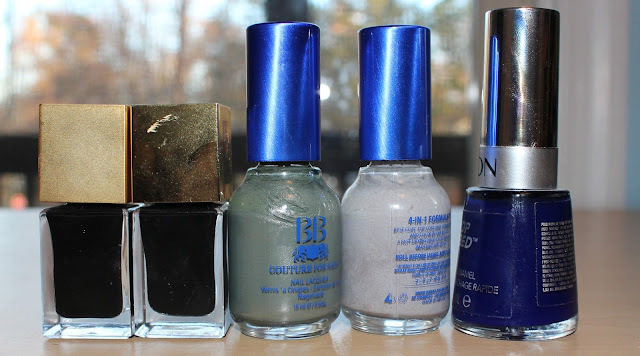 Zoya Electra, Storm, Pretty & Polished Valentino, Nails Inc Snowflake, Colors by LLarowe Y U All Up In My Grill, Ciate Jewel. $3 each. 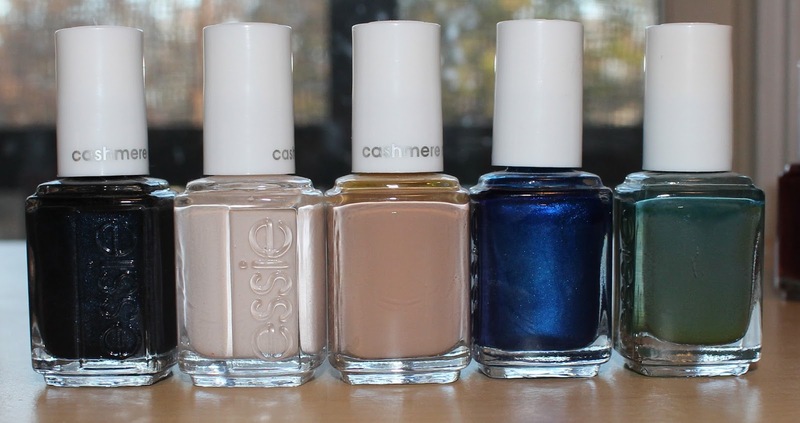 Essie Spun in Luxe (new), Wrap Me Up (new), All Eyes on Nudes (new), Aruba Blue, Vested Interest. $3 each. 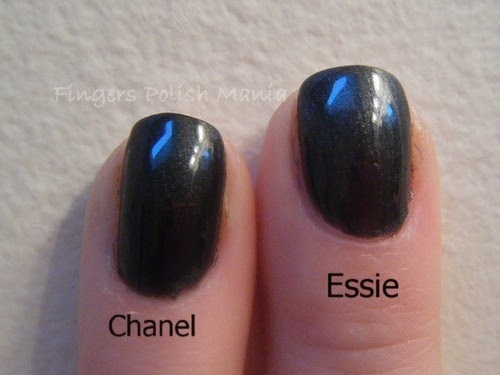 Essie Very Structured, Shearling Darling, For the Twill of It (new), Antique Rose, Twin Sweater Set. $3 each. This is Chick Biker Chick, Rocker Chick, Hen House, Raven's Egg, Baby Cakes $2 each. This is Chick Hipster Chick, Honey Bunch, Gavie Green, Moss, Wild Rooster $2 each. 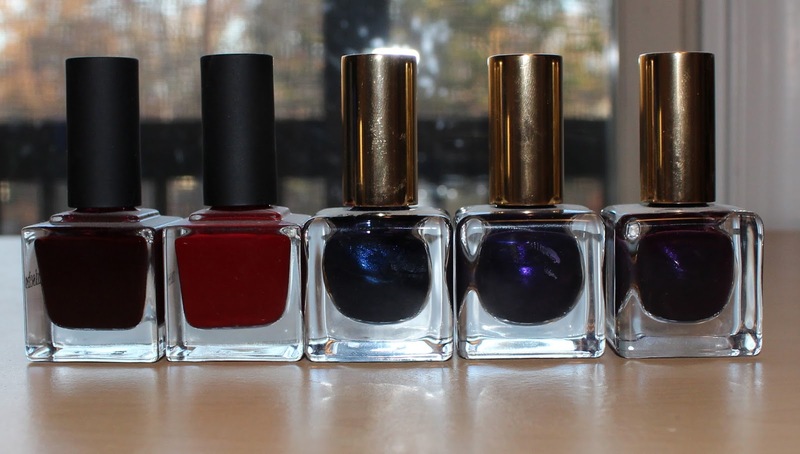 This is Cirque Fascination Street, Lonesome George $5 each, Literary Lacquers Phenomenal Woman $2, ILNP Fall Semester, Black Orchid, Homecoming $4 each. 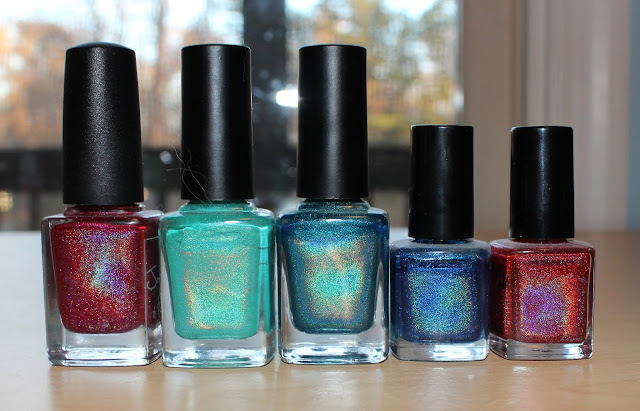 This is Jaded Co Custom, Too Fancy Lacquer Teal Me A Sea-Cret, Keep Calm and Be Fancy, Glitter Gal Marine Blue, Red $4 each. 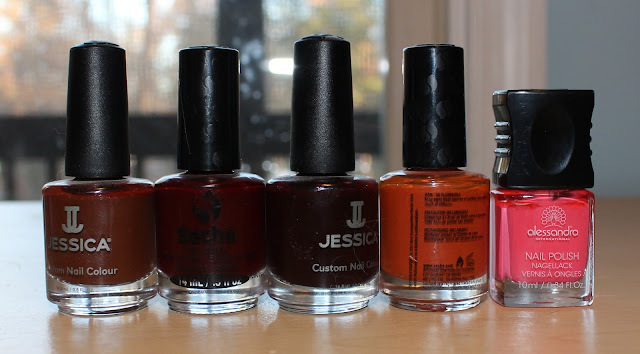 This is Jessica Brown Sugar, Seche Up Close and Personal, Jessica Crimson Tattoo, Seche Silly But Sensible Alessandra Hurly Burly (new) $2 each. 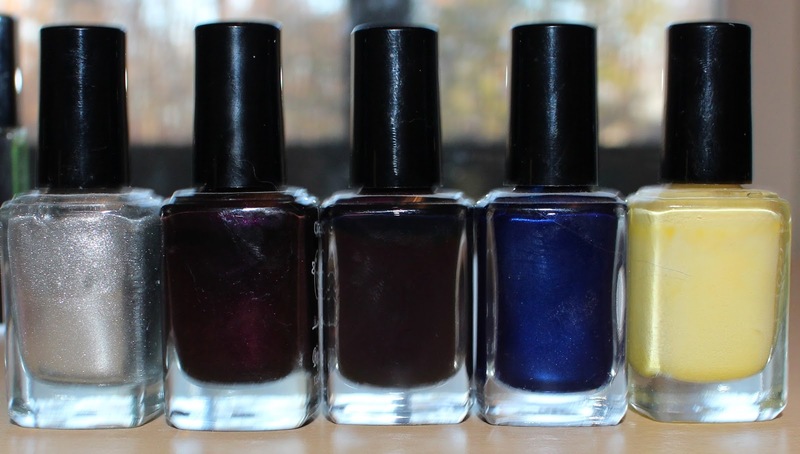 This is Mischo Beauty Backstage Beauty, Front Row, Estee Lauder Blue Blood, Bete Noire, Black Plum $3 each. This is YSL Matte Black, Shiny Black $5, BB Shaded Ash, Smoke, Revlon Royal $2 each. There you have it. My huge freakin blog sale. I really need you guys to take these off my hands so I can add more! This is 40 pictures of polish!!!! Remember contact me using the message me button under my profile picture.